The MyID QR Code Sport, is a two-tone silicone band that is great for both kids and adults. Featuring a color-contrasting medical caduceus symbol on the front and has 3 points of access to your personal, medical, and emergency contact information on the inside. 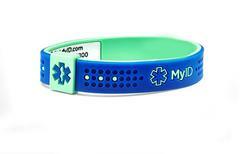 MyID Sport is simple, yet effective, comfortable, and durable. 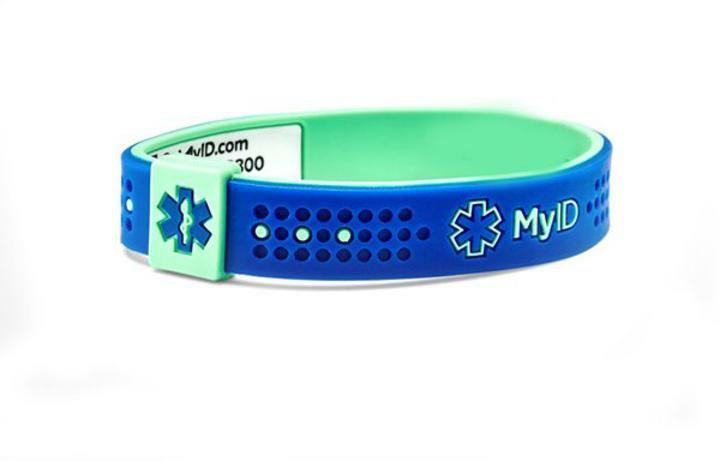 This waterproof personal ID bracelet has 3 points of access on the back, scannable QR code with PIN, A 24-hour call center number, and website, so that first responders emergency medical persona can more quickly and effectively treat you in an emergency. Your online health profile is secure, accessible, and easy to update both online and via MyID™’s free app. There is no limit. Feel free to link 10 bracelets, 5 sticker kits, and a wallet card all to one profile. Once you make an update to that profile, all your linked products are updated instantaneously.